The renovation inside the cottage is almost finished. Currently, I am working on shelving for items and a cabinet/shelf for an electric fireplace, television and equipment. They need to be sanded, primed and painted and this should bring the project to an end. Cold weather has finally settled in and the new heater is working perfectly. In fact, it tends to get too hot inside the cottage if I am not careful with the setting. As of now the heater is set at the lowest setting and it can be too much for me when working inside that I need to slightly open a window to further adjust the temperature. 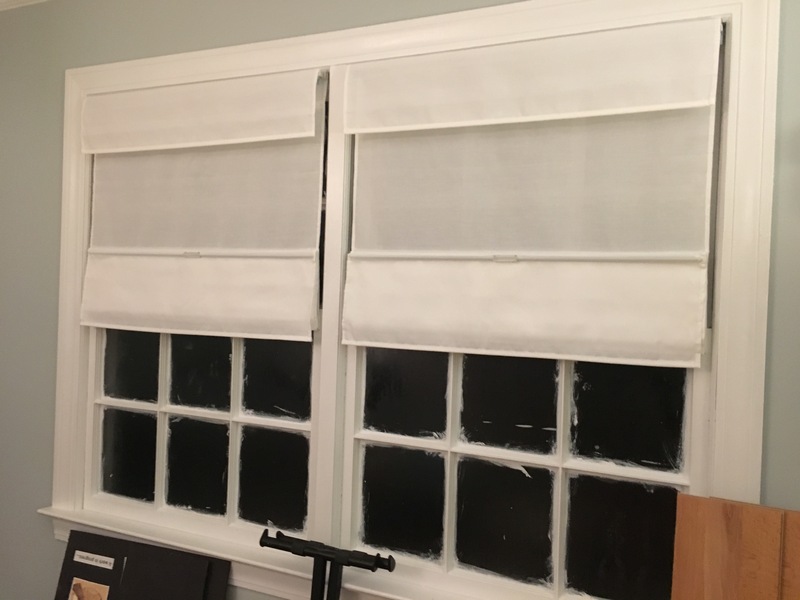 Also, since the windows are not insulated the gas heat causes condensation to build up on the glass which has unfortunately caused staining on a couple of the new Roman shades I installed. New magnetic Roman shade. The window panes are slowly being scraped of paint. Gods, it takes for ever! In the garden most of the plants are now showing effects of the cold. As I mentioned in another post I had neglected the garden for most of the growing season while I worked on the cottage. However, I have been tending to things as much as I could and will begin to focus on cleanup for the winter months. 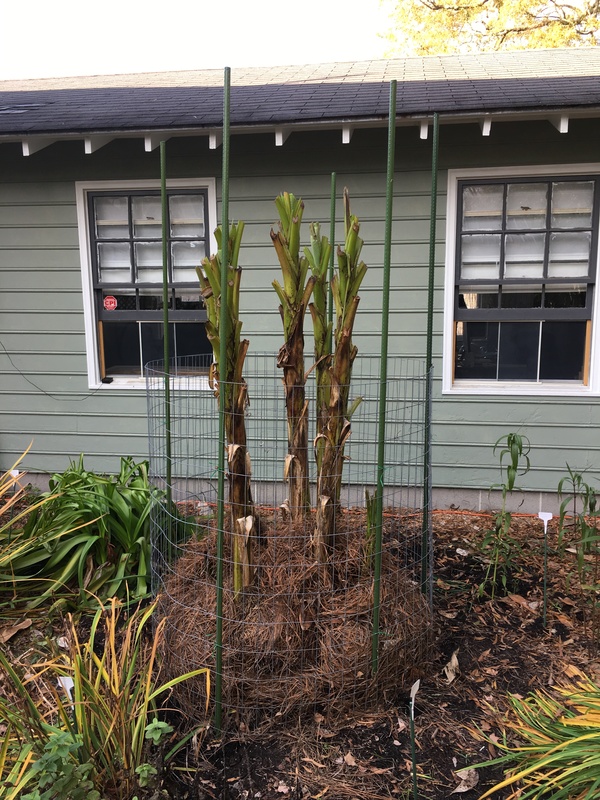 I have two clumps of Musa basjoo banana trees that have now gone dormant which means it is time to cage them for the winter. This process was successful last year, and I hope it will be again. The idea is to preserve the pseudo stem from dying back to the ground. In spring new growth will sprout from the top of last year’s growth and the trees will grow taller than the previous year. This is an especially helpful technique if you happen to live in a cold climate because while the Musa basjoo is cold hardy it will die back to the ground and in spring will sprout up again, but you will never get the dramatic height due to a shorter growing season. Preparing to ‘cage’ the banana trees. The banana trees closest to the cottage are the largest and are more protected from winds and cold. This is my main grouping that I wish to maintain the height. The other clump is on the side of the house and not as well protected. 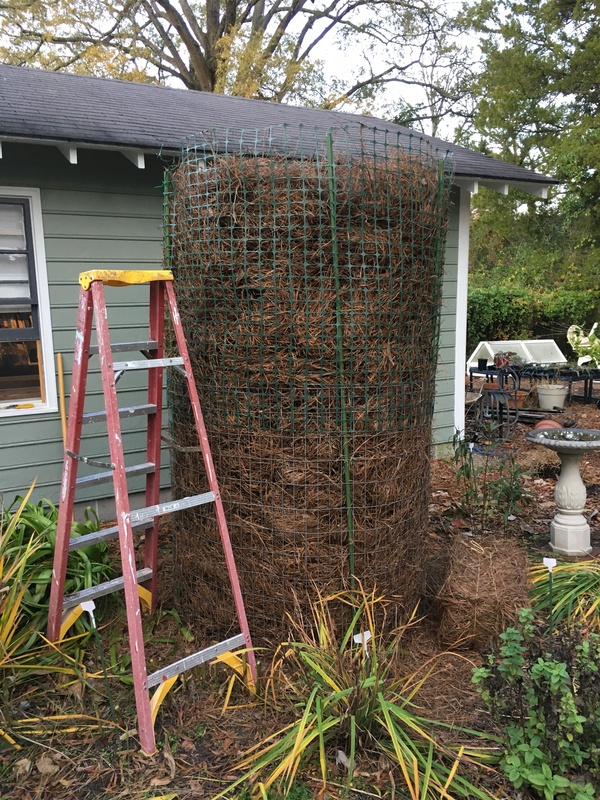 I had hoped to cage them this year too, but I may have run out of time and I most certainly ran out of pine straw. The cottage clump took 12 bales of pine straw! During the winter season I will be working on the beds to tidy them up and prepare them for spring. Actually, there is much to do because the garden tour will be happening again next year, and I have been asked to be in it, which I naturally said, yes. This topic will be written about in the coming months with a sense of anticipation and urgency, I am most certain!